Tony Adigun’s Fagin’s Twist at the Theatre Royal Winchester. Continuing to push the boundaries of Hip-Hop Contemporary dance, Avant Garde provides an intensive participation model for people all around the country to give easy access to dance industry. Fagin’s Twist is generously supported by Arts Council England. Win Guide editor and national dance critic for The Times Donald Hutera interviews Yorke Dance Project’s Yolande Yorke-Edgell. Founded by the dancer and choreographer Yolande Yorke-Edgell, Yorke Dance Project arrives at Theatre Royal Winchester on Tuesday, March 24 with a programme of work under the umbrella title Figure Ground. Outstanding, as Sanjoy Roy wrote in The Guardian. He also garnished his review with four stars. On the basis of my own viewing earlier this month of two dances on the bill, my colleague was not off the mark. One of the highlights of the evening – and a big feather in the company’s cap – is the commission of a new work from Robert Cohan. Born in New York in 1925, as a dancer he was directly associated with the choreographer Martha Graham and, indeed, was an onstage partner to this American dance legend throughout the world. In the 1960s Cohan came to the UK where he helped transform the cultural landscape via his post as the founding artistic director of The Place. A converted drill hall a stone’s throw from Euston Station, the building was home to London Contemporary Dance School and London Contemporary Dance Theatre. Cohan headed and created work for the company for two decades. Cohan, who turns 90 later this week, is living history and a fount of knowledge and wisdom. Yolande Yorke-Edgell is aware of how fortunate she is to have him as her mentor. Her own career trajectory takes in several other key figures in dance both in Britain and abroad, including Richard Alston (Yolande was a member of Rambert back when he ran this celebrated company) and, in Los Angeles, Bella Lewitzky (for whom Yolande danced many leading roles and served as a master teacher). Yolande danced in Alston’s eponymous troupe in the mid-noughties before forming Yorke Dance Project in 2009. Donald Hutera: Where were you born, Yolande, and did you ‘always’ know you wanted to be a dancer? Yolande Yorke-Edgell: I was born in Hertfordshire, and my mother was a dance teacher so I grew up with dance. It’s always been a part of my makeup or in my DNA, I guess. I’ve taken many paths away from dance, mostly due to injury, but always ended up back in the studio. 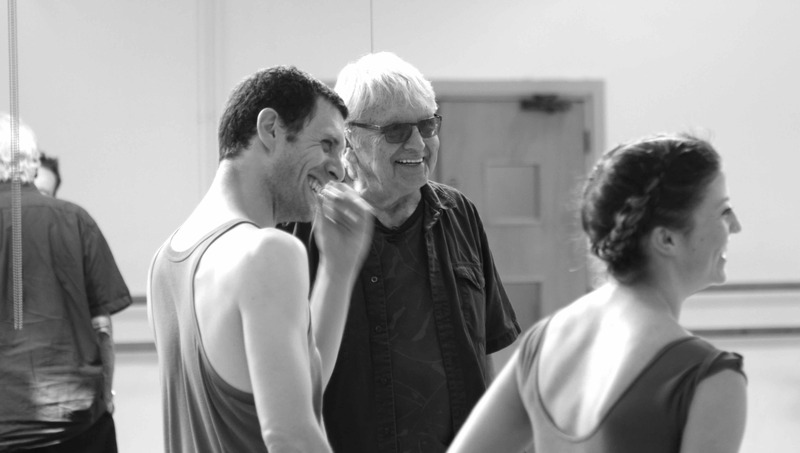 DH: How would you describe Bob Cohan both as mentor and choreographer? What does he bring to a studio and what specifically has he given you? YYE: We first started working together when he reconstructed the solo Canciones Del Alma in 2013. [Ed. note: this dance was created in 1978 and was only shown once in the UK at The Place in 1979.] This gave us some time to get to know each other, which led to him mentoring me and ultimately creating a new work for us. As a mentor he’s incredibly generous. When I was creating Unfold To Centre [Ed. note: this septet is inspired by an award-winning 1978 computer-animated film by Larry Cuba that features visual objects composed of points of light], Bob would come and observe once a week. My original idea was to create an abstract piece that would connect solely with the animation, and be a response to it. What was clear when I spoke to Bob after our first rehearsal was that we needed a story, or a meaning, for it all. He’d challenge my thinking, and what made sense. What’s the reason for the dancers to do a certain movement? What’s leading them? Throughout the whole rehearsal period he’d make suggestions but always ended by saying, ‘You must do with what you feel is right.’ This dialogue is still evolving. We still talk about what works and does not work after every performance! 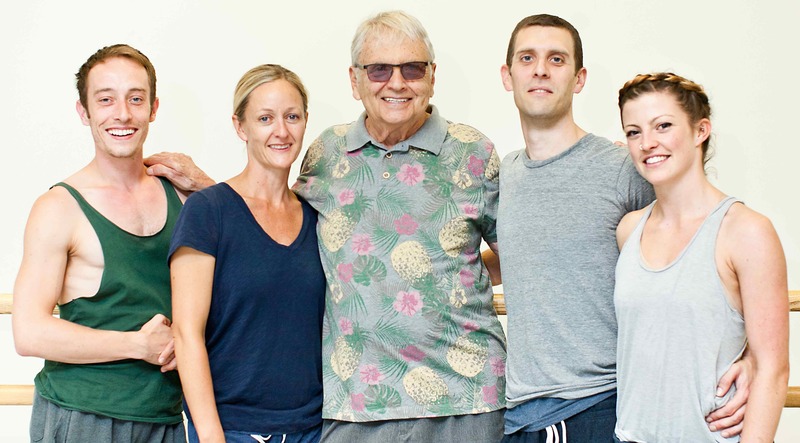 As a choreographer Bob’s a constant inspiration – and that’s not only from a choreographer’s point of view, but from a dancer’s too! Everyone’s benefited from working with him. He talks directly to us, and has a way of describing what he wants so clearly and a lot of the time with humour. With the use of video and Vimeo Bob has been able to watch rehearsal footage and see what works; he then goes away and comes back in and makes the changes he needs. I think he’s been fascinated with the way we use technology in the studio now. That was part of the inspiration for Lingua Franca. DH: I know this quartet was inspired by Bob’s 1984 work Agora, but how much of a blueprint – either used or ignored – was the original dance for him? YYE: The whole idea for Lingua Franca came about when we were doing a lecture-demonstration at Winchester University in early 2014. The company was warming up onstage. Jonathan Goddard [Ed. note: this award-winning dancer – and a founding member of New Movement Collective – was interviewed by The Winchester Guide last autumn] was looking at material we were about to perform on his laptop, and the rest of us were either going through steps before the performance or doing our own stretches. Bob found this fascinating, seeing how each of us had our own way of preparing our bodies and with our own movement language. It’s what inspired the opening of Lingua Franca. We had a three-week rehearsal period scheduled for making it. We only had a very poor quality video to look at of a company in Bergen, Norway that had reconstructed Agora, and it was difficult to really see what they were doing. It was also set to violin, and we were going to set it to piano so there were some musical challenges too. We set up each day so that the company would do class and learn material from the video, and then Bob would come in for two or three hours and work with us. Once we’d learnt the movement Bob started to rework it. His aim was to work with the dancers he had to create our own language. This was a challenge for him, as he’s mainly worked with dancers he’s known for a long time and trained. We’re familiar with each other, but it’s as if we’re having a new conversation each time. We also found the way we set this dance up spatially has a big impact. We now know that we always have to be quite close to each other, and not let the movement spread too far away or we risk losing our connection. If you were to look at the video of the dancers in Bergen doing Agora you’d see similarities, but Lingua Franca is very different. The emphasis is on the dancers as individuals, moving how they move but responding to each other. It’s fascinating to perform as it really exists in the moment and how we’re feeling that day, and if we’re lucky enough to have Eleanor Alberga [Ed. note: a composer/pianist whose own composition is heard in the piece alongside Bach’s Chaconne in D minor] play live for us she’s also part of our conversation. DH: Back to Unfold to Centre. Is it typical of your work, and how would you characterize your choreographic style generally? YYE: Unfold isn’t typical of my work at all. I usually make works based on stories or people, with movement that’s less technical than flowing and that has a strong musical connection. But I like to try new approaches, and with Bob mentoring I was excited about what might happen. My inspiration was a film by Larry Cuba that I came across by accident on Youtube and loved. At first it was really difficult to just make movement in relationship to the animation. Also I was looking at the patterns on a laptop and not projected onto a wall, and so I had to imagine what it would look like a lot of the time. It was clear after a few rehearsals that I needed more to work with, and so after many discussions with Bob I created a story for the piece. I decided that the dancers were a group of beings that lived in a place where there was little light. They had a leader, danced by Jon, who calls to the darkness to bring light, which is in the form of animation. There’s a routine or ritual to what they do as that’s how they exist; their slow pushing/pulling movement is them feeling their way around their world, sensing each other and staying connected. They must complete the rituals in order for them to receive light, which transforms them. DH: It can be useful and fun to consider other senses when talking or thinking about dance. So, on that note, what temperature would you say Unfold To Centre exists in, and what might it taste or smell like? YYE: It’s interesting that you should ask about smell. I would imagine chalky – as if they’re on their own planet, in their own world, with rituals that they must perform in order for them to have light. I imagine this would be their day, which reaches a climax when they make sure to have the last moment of light before resting, and then a new day and new ritual will begin. There’s a coolness where these people onstage are, but warmth from the light falling upon them inspires them to really move. DH: Could you say something about the solo Canciones Del Alma and what it means for you as its interpreter? YYE: The solo is really a meditation for me. It takes me on a journey in three parts. The first is dark and searching, the second cold and full of angst and the third is a resolve, with warmth and light and much contemplation. I find new moments in each performance, and although the general feelings are the same I hear, see and feel something different each time. It’s very powerful, and my challenge is to share this with the audience and not let it stay with and around me. The more personal it becomes the more I need to let them in. DH: Figure Ground also contains another short dance, called No Strings Attached, made by Charlotte Edmonds when she was 16 or 17 years old. How is it that you know her and offered her such a wonderful opportunity? YYE: I’ve been incredibly fortunate to work with such significant artists. Part of what I love most is not only that I’ve been able to hear, see and experience their work but am able to share it with the dancers I work with, and all the students I teach. Charlotte was one of my students at The Royal Ballet School at White Lodge. I was aware of her talent as a choreographer, having seen her work in competitions held there. What she created has developed over time. When she first began she had a very strict plan, and part of my job as a mentor to her was to offer suggestions of new ways of working. This was particularly relevant when creating partnering. I remember Bob being present at one of her rehearsals, and he suggested she put herself in the movement so she could feel what she needed rather than try and guide it from the outside. She was then able to experiment with giving the dancers tasks and asking them for movement, which was new for her. The work reflects these possibilities. There are moments that are really strong, and others that need developing – but that’s maybe true of a lot of work including my own! I think it’s an incredibly impressive dance, and we’ve had some wonderful feedback from audience members. DH: What do you want, need or expect from the people who dance in the company, and in your work? YYE: There are two things I look for, and one is no more important than the other. I look for a dancer that moves me. A dancer can be technically very good, but if they’re not present in themselves – and instead are more concerned with what they look like – then I’m more likely to choose a less technical dancer who has the ability to say something in their body. They also have to have the right personality. I’ve had experiences in the past with dancers who create an uncomfortable situation which alters the dynamic between all of us, and as we’re such a small company this can be difficult to deal with. Currently the dancers in the company are all such lovely people. We have a great atmosphere in the studio and on tour, which I think comes across onstage too. I remember when I contacted Adam Cooper about a role in his production Les Liaisons Dangereuse, he asked to meet me to discuss the project. At the end of the meeting he offered me the job. I asked if he wanted to see me dance and he said he didn’t need to. He’d asked people I’d worked with at Rambert about me, and that was good enough; getting a sense of me himself was what was important. I understand now how important that is. I did the same with Phil Sanger. I saw him dance only on video, but he was recommended by Richard Alston who worked with him at Phoenix Dance Theatre [Ed. note, this high-profile touring company is based in Leeds], so I met with Phil and he’s such a lovely person I asked if he would join us right away. DH: Is there anything else you want to say about plans and ambitions for the company and your work? YYE: It’s taken a few years to really define ourselves. Now we’re at a place where we can move forward knowing exactly who we are and what we’re trying to achieve. It’s clear that the past has a huge place in what we do, as does the future. We’ll continue to work with Bob, and I’m in the very early stages of discussing a potential Kenneth MacMillan work for our next production. There will also be a commission for an emerging choreographer, and I’ll continue to develop my own work. We have strong ties with America, and I’m developing connections with universities and colleges there. Bob and I are conducting master classes in California following this tour, and hope to do more later this year. We’re also developing a choreographic residency that we want to pilot this summer. Lots of exciting possibilities! The arts & culture guide for the city of Winchester in Hampshire. Enter your email address to subscribe to the Win Guide and receive notifications of new posts by email. Tess Wheeler on Why Wine in Winchester?